Happy Monday everyone. I hope you had a great weekend. It's back to the grind and my brain is getting wired for more work, more possibilities and knocking items off my to do list. When I purchased this blue gingham shirt, I had a difficult time styling it. The reason is it's a little too big. I got it in large from Old Navy to fit over my chest so it's big every where else. Surprisingly, I've been able to wear it a number of times. As you can see from my remix below, I make it work by layering. I may alter it later to fit better so that I can wear it alone. Today's outfit was inspired by this pin from Serena Saga's blog. 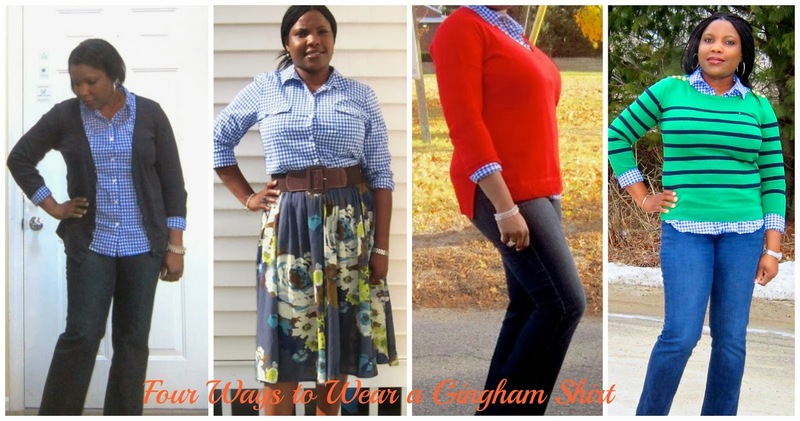 I really love the different ways you've styled this gingham top! It looks great against the green sweater. Thanks so much for co-hosting Mix it Monday today! I love gingham- cute every way you styled it. you can't go wrong with a good gingham! And I LOVE that green sweater! Such a pretty color on you! I really like how you styled this! The sweater is gorgeous and perfect with the gingham layered underneath! Very cute! You look absolutely gorgeous :)))) love it . So cute! love the mixed prints! Visiting from Because of Jackie. Love the mix of gingham and stripes! I just love mixing prints! I love the gingham and stripes together. It goes so well! It looks amazing with that skirt too!! So versatile :) Thanks for linking up for What She Wears!